MATURE-age Melbourne rookie Aaron Vandenberg didn't seem too keen to make it at first. The first time he arrived at Ainslie from the southern coastal town of Tathra to play under-18s, he didn't last. When he fronted up a second time, the famous Canberra-based NEAFL club was not prepared to indulge any excuses. When it came to negotiating a deal for the youngster, the club cheekily decided to buy him a bike. The message was obvious: get fit. Soon enough Vandenberg was doing a 70km round trip between work, training and home every single training night. Ainslie coach Chris Rourke was impressed. "He didn't get off it [the bike] and went from being a very ordinary runner to the best runner at the club who runs a 10-minute 3km run. 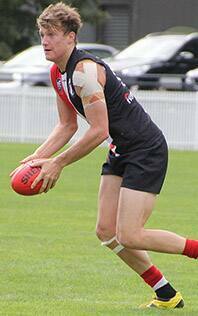 He just got into it and he loved the hard work and has been fantastic," Rourke told AFL.com.au. The club organised a job in a factory for Vandenberg and former Adelaide Crows player Robert Shirley took him under his wing. With 151 AFL games experience, Shirley taught him what was required to prepare to play well. Vandenberg's condition improved and he was good enough to play as a forward in the club's 2011 premiership, changing the game with two goals in the second quarter. "He was really driven. He wanted to be the best. He hates losing, so we were fortunate," Bourke said. That competitive spirit was well known in the NSW coastal town of Tathra, where he'd rocked up to footy training sporting Fremantle gear as a youngster who had moved from Western Australia with his family. His coach Kevin May took a look at him and hoped his love of the game would be matched by his ability. The simple motto of the junior team May coached eventually became 'get it down to Aaron and he'll do the rest'. In between kicking goals, winning best and fairest awards and being part of junior premierships, Vandenberg tried all sorts of sports – at one stage he took a year off football to play hockey, a game he excelled in as a junior, and soccer. But eventually he found his way back to football, making a memorable impression in the seniors Grand Final of 2010 when he demanded more of his teammates at quarter-time after Tathra trailed Bateman's Bay. "He came into the huddle, grabbed a football and slammed it down and said a few words. You could see he was on a mission," May told AFL.com.au. The team lifted immediately and won by 51 points. Whether he would take the next step remained an open question, however, as he was still playing on a flank at Ainslie. In 2013 a spot opened up in the midfield and Vandenberg took his chance. He won the club's best and fairest and then backed that result up again in 2014, also finishing runner-up in the NEAFL MVP. By then he was settled, continuing his boilermaker apprenticeship and harbouring distant hopes of getting a chance in the AFL. He averaged 32 disposals, with a standout game against Eastlake landing 56 possessions. "He could always find the ball," Rourke said. The Demons could not overlook his consistency and decided to add the 22-year-old to their rookie list, using their first pick in Wednesday’s rookie draft to get him. Vandenberg still has to overcome a shoulder injury when he arrives at Melbourne but the foot is now in the door. And he has once again proven the quality of the game in Canberra. On Wednesday he became the third player from the ACT to join an AFL club – after Logan Austin (Port Adelaide) and Jack Steele (Greater Western Sydney) – proving Canberra-based AFL clubs can provide a pathway to the big smoke. "If you want to work, your dream can stay alive," Rourke said.